That’s right: January isn’t over and I’ve already plowed through not one, not two, but three books on my way to a record year for devouring tomes of the written word! Chapters was “down for maintenance”, so no link for them! If Gurbaksh (his friends call him “G”, and since he’d *obviously* want to be my friend after meeting me, I’ll refer to him that way from here on) seems familiar to you, it may be due to his recent stint on FOX’s Secret Millionaire show. I bring this up for one very important reason: DON’T BASE YOUR VIEW OF THE BOOK ON THAT SHOW! I re-watched the episode on YouTube tonight and to be honest he comes off like a douche at first, with his letter G on everything and his overuse of “bam”. Keep in mind that its a FOX show, and while mind-numbingly entertaining, their style of production is always on the extreme dramatic-effect side of the spectrum. But reading his book is nothing like what you see on the show. Here we have a story of hope, desire, drive, and determination. 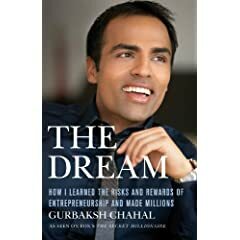 This book chronicles his life from his parents coming to America from India through his adolescence and into his professional career…which, btw, started at 16, and the guy is only turning 28 this year. During the height of the dot-com craze, G began a web advertising company in his bedroom…at 16. He grew the company and eventually it got bought, he made $40 million (on paper) on the deal. That eventually led him to start Blue Lithium, another web ad company, which he sold to Yahoo! for $300 million dollars. The book is his story, but not just recounting the happenings. G talks about the lessons he learned in just over a decade of entrepreneurship. It’s also an interesting look at the unique struggles minorities must face in the business world and a warning of the realities of doing business. Dealing with family issues and concerns, being hounded by a former employer who launched lawsuits against him, having to overcome other’s concerns about his age, and just the work involved in starting and selling two successful companies make this book an interesting and worthwhile read for anyone who is thinking about getting into business, currently in a business venture, or who is feeling stuck in their current job. G’s story is one of empowerment and freedom: empowerment by having an amazing attitude and freedom that comes from hard work and taking ownership of your own life.